Nigerian songstress Asa will release her soulful and uplifting sophomore album, Beautiful Imperfection, in the US on September 6th through Naïve Records. Building upon the tremendous international success of her 2007 self-titled debut, Asa expands both her emotional and stylistic range on her follow-up. Beautiful Imperfection has already received acclaim in numerous countries across the sea, and now Asa is setting her sights on the US. From the opening track, “Why Can’t We,” it is apparent that Asa is exploring new territory with this collection of songs. While being anchored in the same timeless and heartfelt spirit of her debut, she has also grown as an artist and taken the next logical step in her evolution as a singer and songwriter. Asa first caught the ears of her global audience with her smoky voice and confident political messages, which were wrapped in deceptively sweet melodies and laid-back acoustic guitar strumming. On Beautiful Imperfection she has shifted her goal towards creating more joyous, uplifting music, while weaving together 60’s soul, pop, reggae, rock, and more. Tracks like “Be My Man” have a playful, up-tempo feel while others, such as closing track “Questions,” are gorgeous, haunting ballads. 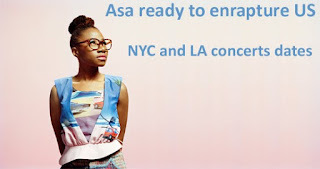 The decision to include songs with more of a positive, hopeful sentiment was a natural one, as Asa wrote the new material while her aspirations of being a musician were finally fully in motion. Growing up in Lagos, Nigeria, she spent countless hours getting lost in the music and messages of artists like Fela Kuti, Marvin Gaye, Michael, Jackson, and King Sunny Adé. Though she always dreamt of being a musician herself, she didn’t think this goal was within the scope of her reality. However, as a teenager Asa’s mixture of perseverance, talent, and good fortune led to her being discovered while performing while an ensemble in France. Now Asa is ready to fully follow her muse and bring the whole world along with her.